Based on the combined finite-discrete element method (FDEM), a two-dimensional coupled hydro-thermal model is proposed. This model can simulate fluid flow and heat transfer in rock masses with arbitrary complex fracture networks. The model consists of three parts: a heat conduction model of the rock matrix, a heat-transfer model of the fluid in the fracture (including the heat conduction and convection of fluid), and a heat exchange model between the fluid and rock at the fracture surface. Three examples with analytical solutions are given to verify the correctness of the coupled model. Finally, the coupled model is applied to hydro-thermal coupling simulations of a rock mass with a fracture network. The temperature field evolution, the effect of thermal conductivity of the rock matrix thermal conductivity and the fracture aperture on the outlet temperature are studied. 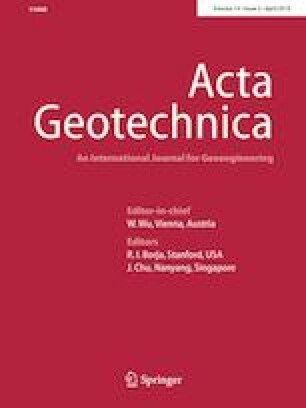 The coupled model presented in this paper will enable the application of FDEM to study rock rupture driven by the effect of hydro-thermo-mechanical coupling in geomaterials such as in geothermal systems, petroleum engineering, environmental engineering and nuclear waste geological storage. This work was supported by the National Natural Science Foundation of China under the Grant Number 11602006; the Beijing Natural Science Foundation under the Grant Number 1174012; the Fundamental Research Funds for the Central Universities, China University of Geosciences (Wuhan); the Chaoyang District Postdoctoral Science Foundation funded project under the Grant Number 2016ZZ-01-08; and the National Natural Science Foundation of China under Grant Number 41731284, 11672360 and 51479191.